Coach Ronald (“Rocky”) Nelson – in Woburn, December 2, 2018. Beloved husband of Alison (Carney) Nelson. Loving father of Courtney Sigsbury, her husband Duane and Tiffany Nelson-Boyd, her husband Matt Boyd, all of Woburn. Cherished “Kucko” to his three grandchildren, Dylan Ronald Sigsbury, Quinn Nelson Boyd and Ali Diehl Boyd. Dear brother of the late Russell Nelson. Longtime best friend of Michael McLaughlin, his wife Mary Jane, as well as survived by numerous nieces, nephews, cousins, friends, past students, coaches and athletes. A Funeral Service will be held in St. Charles Church, 280 Main Street, Woburn,Thursday, December 6th at 11 a.m. Interment will take place at the convenience of the family. Relatives and friends are respectfully invited to call at the Lynch-Cantillon Funeral Home, 263 Main Street, Woburn, Wednesday, from 2 – 8 p.m. At the family’s request PLEASE OMIT FLOWERS. In honor of Rocky, remembrances may be made in his memory to The Coach Rocky Nelson Scholarship Fund c/o Winchester Co-Operative Bank, PO Box 758 Winchester, MA 01890. For directions or to leave an online condolence, please visit www.lynch-cantillon.com or Facebook under Lynch-Cantillon Funeral Home. Coach Ronald (“Rocky”) Nelson, legendary Woburn High School Football Coach and lifelong Woburn resident, died peacefully, Sunday, December 2, 2018, after a brief battle with lung cancer, at the age of seventy-four. He was the beloved husband of 47 years to, Alison (Carney) Nelson. Born in Winchester and raised in Woburn, Rocky was the dear son of the late Paul and Eleanor (Lundholm) Nelson. Rocky was a tremendous athlete growing up, and was a graduate of Woburn Memorial High School, where he served as captain of the Football and Hockeyteams his senior year. After graduation, Rocky attended Bridgton Academy in Maine for a post graduate year and earned a Division 1 Scholarship to the University of Cincinnati, where he was a proud and dedicated member of their football team starting at offensive tackle for four years. 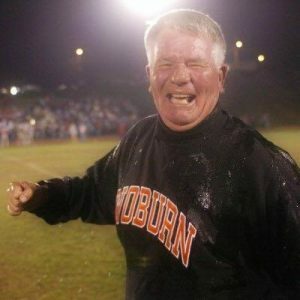 Rocky’s love was football and teaching kids, and he was able to intertwine them as a PE teacher in Woburn, as well as an assistant football/Head Coach for over forty sevenyears. In 1986, after being on the coaching staff at Woburn High School for 16 years as the defensive coordinator, Rocky took over as the head coach of his alma mater.He retired in 2016 after an unbelievable Thanksgiving game win over arch rival Winchester. During his time as head coach, he won 208 games and a Super Bowl in 2005, making four Super Bowl appearances during his tenure as head coach. Rocky was inducted into the Massachusetts High School Football Hall of Fame in2016. After retiring from Woburn, Rocky returned to the sideline again as an assistant on his son-in-law’s staff at Billerica Memorial High School. Helping guide the Indians to the 2017 MVC League Championship and back to back playoff berths. Rocky was not only a dedicated and devoted coach, but he was a dedicated, devoted, loving and supportive husband, father, grandfather, and friend. His family meant the world to him and he loved being called “Kucko” by his grandchildren. He enjoyed watching his grandsons play football, basketball, baseball, soccer, and playing games in the family room with his granddaughter. Rocky loved to vacation in Aruba and Ogunquit Maine and often took the entire family with him so everyone was together. His family was his life as was all of his assistant coaches and players, WIN ON THREE, 1, 2, 3 WIN! Along with his wife Alison, Rocky is survived and will be deeply missed by his daughters, Courtney Sigsbury, her husband Duane and Tiffany Nelson-Boyd, her husband Matt Boyd, all of Woburn. Cherished “Kucko” to his three grandchildren, Dylan Ronald Sigsbury, Quinn Nelson Boyd and Ali Diehl Boyd. Dear brother of the late Russell Nelson. Longtime best friend of Michael McLaughlin, his wife Mary Jane, as well as survived by numerous nieces, nephews, cousins, friends, past students, coaches and athletes. A Funeral Service will be held in St. Charles Church, 280 Main Street, Woburn, Thursday, December 6th at 11 a.m. Interment will take place at the convenience of the family. Relatives and friends are respectfully invited to call at the Lynch-Cantillon Funeral Home, 263 Main Street, Woburn, Wednesday, from 2 – 8 p.m. At the family’s request PLEASE OMIT FLOWERS. In honor of Rocky, remembrances may be made in his memory to The Coach Rocky Nelson Scholarship Fund c/o Winchester Co-Operative Bank, PO Box 758 Winchester, MA 01890. For directions or to leave an online condolence, please visit www.lynch-cantillon.com or Facebook under Lynch-CantillonFuneral Home. A Funeral Service will be held in St. Charles Church, 280 Main Street, Woburn, Thursday, December 6th at 11 a.m. Interment will take place at the convenience of the family. Relatives and friends are respectfully invited to call at the Lynch-Cantillon Funeral Home, 263 Main Street, Woburn, Wednesday, from 2 – 8 p.m. At the family’s request PLEASE OMIT FLOWERS. In honor of Rocky, remembrances may be made in his memory to The Coach Rocky Nelson Scholarship Fund c/o Winchester Corporative Bank, PO Box 758 Winchester, MA 01890. For directions or to leave an online condolence, please visit www.lynch-cantillon.com or Facebook under Lynch-Cantillon Funeral Home. I believe Rocky was the assistant football coach during my time at WHS. I am not sure if he coached the “throwers” (football players) during the track season. As a scrawny runner of no particular importance, Coach Nelson was always friendly, respectful, and non-judgmental. I still love scholastic sports, and I followed his many accomplishments. Even though I didn’t know him well, I’m not surprised to hear the many compliments about him. It matches up with my memory of a kind person. My condolences to the Nelson family,a great guy,a Tanner legend,RIP Rocky. I was saddened to learn of Rocky’s passing yesterday. My wife and I send our deepest condolences to family and friends. Rocky and Alison, Courtney and Tiffany were close family friends of our family, especially my grandparents and my Uncle – and opened up their hearts to me as a teenager whenever I needed company from time to time. Now, as I sit here typing all I can think is that he is reunited with his great friend, my grandfather, “Bishy”. This Christmas, I will remember fondly the Christmas celebration at the Nelson house as a young teenager with a great appreciation to have been welcomed by Rocky into his home to be with his family like I was one of his own kids. In his home, everyone was family. The football world lost a great coach, mentor and simply-put, a wonderful person. How proud you must be Nelson family, for a life well lived life. He was an inspiration to all that knew him. Competitive and supportive, he always tried to get the job done right. What a legacy his coaching advise will be, forever in all the hearts of students and friends he touched in the Woburn community! Heartbreaking news to hear about Rocky. Words can’t describe the influence he had on my high school years and beyond. What a great man and role model to follow. My thoughts and prayers are with him and the entire Nelson family during this difficult time. And living only 10 minutes away from the UCincy campus, I’ll always have a nice reminder of him in my own backyard. Mrs. Nelson, Tiffany, Courtney and family, I am very sorry for your loss. In your grief I hope that you can draw strength from all the wonderful memories that you made together. I will never forget Coach Nelson, and may he rest in peace. Saddened to hear of Rocky’s illness and passing. I was fortunate to know Rocky at an early age, when he played hockey for my father. Rocky was an amazing person who will be sorely missed by everyone who knew him. Our thoughts and prayers are with you during this sad time. the Halloween Parade, he was always doing something for someone helping when ever he could. Rocky’s name was one of the first I hear of when I began my coaching career at Bridgton Academy in 1986. Coach ALWAYS called us to refer potential kids to us, and his passion for his experience at BA was ever present. When I rattle off the list of our alums coaching-teaching-mentoring young people, Rocky Nelson will always remain at the top. So many memories of this wonderful man and legend. Thinking of you all and wishing you peace and comfort during this difficult time. Alison & family – our hearts are broken to hear of your loss. Sending prayers and love to you all. May your memories comfort you at this time. Thanksgiving Day..nice weather…Woburn-Winchester- New high school…new athletic playing field. Woburn wins first Thanksgiving Day game (and very first game) at new high school…Coach Rocky at the helm. Refreshments at the Tanners Tavern afterwards…..does it get any better in Woburn than that. Our deepest appreciation, respect and sympathy from the Woburn community. When done right a Coach is a dad, mom, big brother, guidance counselor, teacher, motivator, mentor and friend. Rocky Nelson was just that for a long time to very many. My condolences and GODSPEED. We were neighbors and friends almost 30 years ago on Valley Road! Greatest memories when Honey and Rocky got talking!! Will never forget what a kind man he was and how much fun your whole family brought to the neighborhood! Thinking of you, Alison, with love! God bless Rocky and the Nelson Family. Words cannot describe how we feel about Rocky’s passing. He was a great man, Coach, and Friend. We spent great times in the Coach’s Room and he was always supporting of me. Rocky was Woburn and Woburn was Rocky! He will live in the heart’s of all the people who knew him. My condolences to Allison and the entire Nelson family. RIP Coach and thank you for all you did for kid’s of Woburn. Butch Murray and family.